Smith Street, Warwick’s oldest shopping Street. One Street in Warwick now has more than 20 traders that are using Twitter to promote their trading environment along with their individual business. Remarkably the Street in question, #Smithst, is Warwick’s oldest shopping street. So here it is, the old willing to meet the new. However it appears that this is not the case all over the town. Recently an entrepreneur walked the streets of Warwick to promote a #Twitter course for beginners. A tweet from this person revealed a certain amount of hostility & disregard for using this form of communication and promotion. The link below may show just how foolish some are by disregarding new ways to use #socialmedia. The Smith Street Traders Association (SSTA) are also planning to use technology during their key event later in the year. Smith Street hosts a “Party” on the Street. The event consists of a Craft Market, made up primarily of local business’s and other independents. This is coupled with music and entertainment. 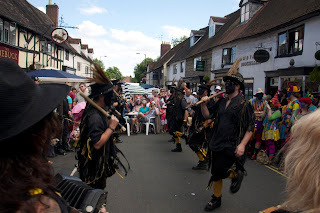 On the same weekend of the Craft Market, it is also the Warwick Folk Festival. Warwick’s internationally renowned festival attracts crowds from all over the world as well as the UK. So this year, to bring the event to even more people, the SSTA plan to stream, live from the Street party. So it appears that the traders of the town’s oldest shopping Street are truly grasping opportunities that the world of technology & Social Media is presenting them. This time last year (2012) should have had the residents and business owners of #Warwick seeing the end of the alleged improvements to High & Jury St. Alas, 12 months later, #humpgate continues. The original plan, which agreed with the Warwickshire County Council (WCC), The Chamber of Trade (COT) and the individual business’s, for the work to commence January 2012. However at The last moment WCC discovered a flaw in the design of the proposed humps. The work was delayed, with no notice given of when the contact may start. Now what a lot of people don’t know is that the design of the layout and construction was done by WCC engineers, not as many were lead to believe by the contractor, Mcveigh. The contract eventually started late March 2012 but no consultation with COT or the business’s of Warwick. No opinions were sought. The work commenced at a most inappropriate time. 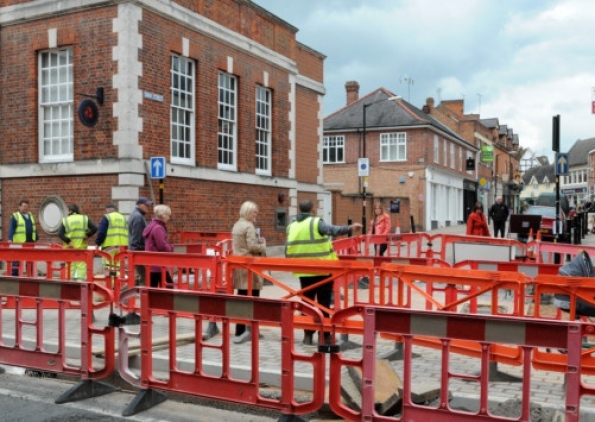 The roadworks were to be very disruptive with many traders suffering a huge downturn in takings over the crucial bank holidays of Easter Holidays. These and associated works cost £496,000.00. They were funded by the Section 106 policy. This figure was gained by using the Freedom Of Information Act (FOI). However This wasn’t the end of the sorry saga. Within 6 weeks the redesign of the original flawed plans showed massive failings. The newly installed speed humps deteriorated rapidly. The traffic, which is pretty constant on this stretch of road, caused the “cobbles” to become loose and now have been replaced. The construction cost of Phase 1 and 2 was £496,000.00 to pay for the road improvements. The remedial works on High Street/Jury Street are required as a result of a design issue and the cost of these are being met from another source. Currently Warwickshire County Council has more than 300 items with section 106 agreements on file amounting to £7.8 million. Section 106 agreements set out a contribution from a developer towards the cost of infrastructure projects. The amount of money raised over a period of time is difficult to identify as agreements are made but the money not made available until the development progresses and some developments are never progressed. The amount we hold fluctuates as money is spent on projects and also contributions are received for new schemes. The figure above is for transport and highways schemes only as contributions can be agreed to other services such as libraries or school. Lo and behold the #humpgate saga has risen its ugly head again. As you have just read above, substantial amounts of money have been spent on making our High St a safer, more pedestrian friendly car / lorry loving environment. Well as you can guess it all went pear shaped quite quickly in fact. The main issue was that a recognisable crossing was taken away and substituted with a “shared” sort of set up. Basically what it means is that no one has a clue what to do. By this I mean pedestrians and vehicles. Yep, folk were just wandering in front of cars, cars weren’t stopping, carnage ensued. Now a year later down the (humped) road our council, albeit with a lot of pressure from various groups and our local MP Chris White have decided to re instate the crossing point. Hurrah we cheered, but hang on a second, where’s the money going to come from? As yet no word from Warwickshire County Council (WCC). Is it going to come from the Section 106 fund or are the ever faithful taxpayer going to foot the bill?